Dandelions are available year round but are at their best from April to June. They are very edible and a great favorite of tortoises and are rich in vitamin A,C and D. Flowers are favoured the most, but stalks contain high levels of Oxalic Acid. 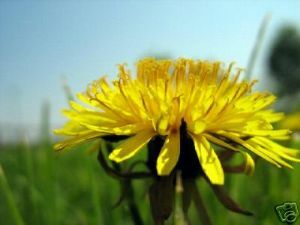 Use as a mixed weed feed since dandelions are a diretic. Dandelion is very easy to grow and cultivate, starting with any soil, or potting soil, plant the seeds in a very lightly sowed row, water and cover with less than 1/8 inch or soil. Lightly water again. Germination will begin in 4-10 days, flowering in 14 days, and seed production in 1 week following flowering.